Pyruvic acid. Black = carbon, red = oxygen, white = hydrogen. Pyruvic acid is formed during the breakdown of glucose and some amino acids. Further breakdown varies, depending on the biochemical system. In yeast, for example, the end product can be alcohol or gas to raise the dough. Pyruvic acid is a colorless liquid organic acid. 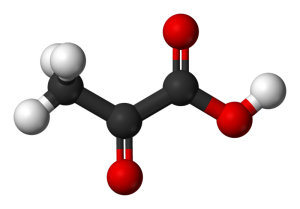 Pyruvic acid smells like vinegar and can be formed by the distillation of tartaric acid. It has the chemical formula CH3COCOOH. A derivative of pyruvic acid known as phenylpyruvic acid occurs in the urine of people who suffer from phenylketonuria. This is a disorder in which the amino acid phenylalanine is not metabolized normally. The carboxylate anion of pyruvic acid is known as pyruvate. Pyruvate is an important intermediate in metabolism, being produced during glycolysis and converted to acetyl coenzyme A, required for the citric acid cycle (Kreb's cycle). 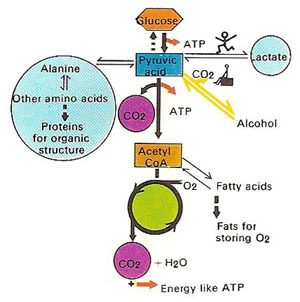 Under anaerobic conditions pyruvate is converted to lactate or ethanol.